- Talking about LC (unfortunately in Polish) - It is worth seeing this video until the end, because the last minute Leonard speaks ! - LC jest odwrotnością współczesnego showbiznesu, w którym wszyscy się spieszą. Potrafił przez dziesięć lat nie wydać albumu, bo kroił sałatki dla swojego mistrza zen - mówi Robert Leszczyński. Leonard Cohen wystąpi już w niedzielę na Torwarze. W "Rytmie Miasta" zwrócił się do polskich fanów! - LC is the inverse of the modern entertainment industry, where everyone in a hurry. He managed for ten years did not make the album, because kroił salads for your Zen master - Robert Leszczynski said. 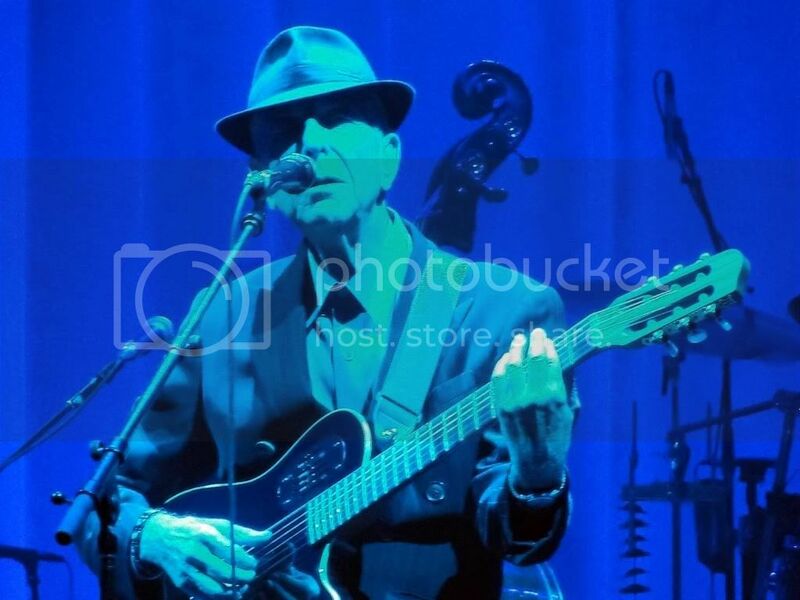 Leonard Cohen will perform on Sunday at Torwar. In "Rhythm City" turned to the Polish fans! sturgess66 wrote: Someone took some video. Uploaded by "Ainemeala" - Thanks!! "Hey, That's No Way To Say Goodbye"
And we now know that this is Tipperary Ann - defying the video Nazis! "Famous Blue Raincoat (conclusion) If it be your will (LC's part)"
jeremek wrote: All these obstacles and difficulties - it was a condition for the concert organizer. Good on you, jeremek - you and I beat the system!! I only intended recording "Hey, that's no way to say goodbye", thinking it might be the final song of my final LC concert. (I find if you're fiddling with a camera all the time it's hard to enjoy every minute of the concert.) But having been semi - thwarted in that I had a go during the encores as well, and have now uploaded what I got. Picture not great in any of these, but sound good for a lttle camera. And Sturgess, thanks for all your dedication and hard work in making videos conveniently available to us; I know I love watching them, especially those from the concerts I have been lucky enough to attend. You probably heard about „the Warsaw summit”: the artist meets the president (Lech Walesa). it was so great to hear that mr. walesa was there. hope he enjoyed the show. It is something fantastic! Thank you, Jarkko! Thank you, Daniel! Excellent material from "the besieged Warsaw." "Leonard jest uprzejmy jak zawsze i mówi, żeby skierować zaproszenie do jego menażera. Ale zaznacza, że w przyszłym roku nadal będzie w trasie. Leonard kindly as always asks to forward the invitation [to the Miłosz Festival in Krakow, May 2011 ] to his manager. At the same time he points out he will still be touring next year." Another "One of the Last Concerts" in Las Vegas ? Last edited by mirka on Tue Oct 19, 2010 12:11 pm, edited 1 time in total. Thank you, Mirka (Beata, was this the article you cited before?)! Seeing Leonard play live in Krakow would be a dream come true, wouldn't it ? Heike wrote: Seeing Leonard play live in Krakow would be a dream come true, wouldn't it ? I understand from the interview that Leonard cannot accept the invitation to Krakow b/c he will still be on tour next year. Heike wrote: Thank you, Mirka (Beata, was this the article you cited before?)! Overlapping themes, such as in the case of an interview with Polish (example: two topic - Katowice/short interview). It is important that, in case of this link one should thank Jarkko and Daniel. Jarkko already wrote this link earlier ! /my message to the LC 2011 was also from the website of Daniel Wyszogrodzki (to which this link)/. Greetings to all ! Heike, extra for you ! If it is confirmed the thesis of LC 2011 in Poland, all this will be possible to meet. I am optimistic. A path of human by human unaudited. And fortunately. I got this picture from an audience boot that surfaced at Dime, if it has already been posted and I somehow missed it feel free to delete the post, I am a newbie at this forum. Great pic imo though. I tried using the img code but the picture is too big I think. Welcome to the Forum. You have made a very good start already. I know you will have fun interacting with everyone. Thank you again for the great concert. October 4 in Katowice and 10 October in Warsaw Torwar in the series Deutsche Bank Invites you to a performance by Leonard Cohen. In more than three-hour concert artist will perform his greatest hits, including: Hallelujah, Dance Me To The End Of Love, Suzanne and I'm Your Man. He will be accompanied by a nine-piece band of musicians from different countries (including Spanish virtuoso of exotic stringed instruments, Javier Mas). Trio leads Sharon Robinson, Cohen works with a number of years - it's her compositions to his poems have contributed to the popular album TEN NEW SONGS (including the hit single In My Secret Life) in 2001. In Poland, Leonard Cohen will appear in concerts until after the fourth time in its over 40-year career. In our country, it was particularly popular in the 80's, mainly due to work Zembatego Matthias, who so perfectly translated into Polish, and then performed songs from this artist. In Cohen's output is close to 20 albums and countless singles. In 2003, received at the hands of the Governor General of Canada Order of Canada Canada's highest honor, awarded him for his outstanding contribution to the development of Canadian culture. In 2008 it was adopted into the Rock and Roll Hall of Fame, a prestigious "museum of rock and roll and rock," honoring the artists who made a fundamental contribution to the development of this species. "Wydarzenia - koncert Leonarda Cohen'a"